The 2019 Land Rover Range Rover is a full-size SUV that can transport up to five people. Land Rover has managed to create a vehicle with the perfect balance between luxury, utility and off-road capability. A hybrid model is available for those who want to save money at the pump. The regular engines offer good fuel economy too for a vehicle in this class. The Range Rover is a full-size SUV, but it never feels too large or clunky while driving. There's a lot of options to customize your Range Rover with. It makes for a very comfortable ride too. The latest Range Rover model is a continuation of the 4th generation of these vehicles which began in 2013. A plugin, hybrid model is new for this year. A two-door coupe model of the Range Rover is the first in its class of full-sized SUVs. This is an interesting change of pace for what has always been a traditional four-door model. A new wade-sensing system lets you know the wading depth in real time in comparison to the vehicle's maximum wading ability. The 2019 Land Rover Range Rover provides serious off-road performance. The powerful engine choices and massive amounts of torque can propel your Range Rover wherever it needs to go. It has a great amount of ground clearance for your off-road adventures. It's still easy to get in and out of thanks to the air suspension system. The vehicle is lower to the ground when parked. The AWD gives you great traction on any terrain and during any weather conditions. The Range Rover's off-road performance is among the best in its class. It's also one of the few SUVs out there that can easily wade through water. It's truly a go-anywhere vehicle. The Range Rover comes equipped with a number of different engines. Every one of them offers fantastic performance and plenty of power. You can choose a 3.0 liter, diesel engine that provides 254 hp. The 2.0 Liter P400e Plug-in Hybrid cranks out an impressive 398 horses. A supercharged V-6 provides a good balance of fuel economy and still offers massive power and torque. At the top of the pack is the 5.0-liter, supercharged V-8. On the sport trim level, this V-8 cranks out a whopping 575 horses and 516 lb-ft of torque. As a general rule, the sport package will have more horsepower and torque per engine. It's the way to go if performance is your top priority. The 2019 Land Rover Range Rover offers a ton of cargo and storage space. The rear seats can be configured in a number of ways to enlarge the cargo area while still providing enough room for your passengers. Let's face it, massive cargo space is the reason many of us decide on a full-size SUV in the first place. The standard Range Rover gives you 24.5 cubic-feet of space or 68.6 cubic-feet with both rear seats laid flat down. The extended wheelbase version of the Range Rover offers up to 75.6 cubic-feet of cargo space. The interior is nice and spacious. Five average-sized adults should fit comfortably inside of the Range Rover. It's easy to get in and out of the vehicle and to access the back seats too. The seats have deep cushioning and provide excellent support. One nice feature is how the rear seats can recline for added comfort. The interior materials are of the highest quality. There's nothing cheap inside of the Range Rover. It's comfort and class when you ride inside of this SUV. If you're going to purchase a full-size SUV, it's nice to have adequate towing capacity. After all, these types of vehicles were made for long road trips and off-road adventures. It's nice being able to take a trailer or boat along for the ride. The 2019 Land Rover Range Rover doesn't disappoint here. At the top end of the engine spectrum, you will be able to tow up to 7,716 lbs when your Range Rover is properly equipped. If you're looking at purchasing a large SUV, then it's a safe bet you have a lot of passengers you need to haul around. You want a vehicle that is safe and will keep your passengers protected. Fortunately, the Range Rover is loaded with high-tech safety features. There's a rear-traffic monitor so you always know what's behind you. A driver-condition monitor can make sure the driver is awake and alert. This is a fantastic feature to have on long drives. Land Rover's Terrain Response 2 system makes sure that the right amount of traction is getting to each wheel. 2019 Land Rover Range Rover gives you an endless array of options. You have countless choices for the exterior, interior and optional features. The engine options alone are more than you typically find in this class of vehicles. You can select from gasoline, diesel or an electric hybrid. Interior materials and exterior colors are plentiful here. You can easily customize a Range Rover to meet your specific needs and style preferences. Full-size SUVs are not known for their great fuel economy. The Range Rover, however, provides great fuel economy for a vehicle in this class. If you want to save the most, you may wish to choose the hybrid model. The gas and diesel engines still get good fuel economy too, though, if you prefer a traditional powertrain. The base 4-cylinder has a combined, fuel-economy rating of 23 mpg. The V-6 has a combined rating of 20 mpg. The V-8 isn't the best option here, but the trade off is an impressive amount of power and torque. For the best fuel economy outside of the hybrid, the diesel is your best bet. It gets an impressive 28 mpg. The 2019 Land Rover Range Rover is one of the few full-size SUVs that offers a hybrid model. Even when you run out of gas, the hybrid engine still has a range of 31 miles on electric power. This is a fantastic option for anyone who wants to save big at the gas pump. It's also a great choice for anyone who likes to live in a green, environmentally-friendly manner. At 398 hp, you're not compromising power by selecting the hybrid model either. People choose large, luxury SUVs when they expect to spend a lot of time in their vehicle. If you're going to spend time in the Range Rover, you'll be happy to have this modern, high-tech infotainment system. The Range Rover gives you not one, but two touchscreens. This allows you to view assist cameras, the navigation system and critical info on one screen, as your apps, music and entertainment functions appear on the other. The screens are massive too at 10 inches each. You can connect to your smart devices and control other vehicle functions such as the automatic, rear-seat configuration. The speaker system provides awesome sound quality for your favorite music. Steering and handling is great in the 2019 Land Rover Range Rover. A small turning radius makes this large vehicle surprisingly maneuverable. Some drivers, however, have noticed a few issues at faster, highway speeds. At 55 mph and up, you may notice that the steering feels a bit heavy. Another minor issue becomes apparent only when you hit high speeds. The cabin is normally quiet, but this may change on the highway. You still won't notice other cars and the outside world as Land Rover does a good job of sound proofing. Vibration becomes an issue at fast speeds though. Vibrations will start to become noticeable and cause some unwanted noise. The 2019 Land Rover Range Rover has a massive cargo bay. It only gets better once the rear seats are let down too. A minor nitpick is in the lack of small-item storage. There simply aren't enough pouches, pockets, cubbyholes and drink holders. This is unusual for a large SUV that you expect to spend a lot of time in with multiple passengers. The SUV market is a crowded field. The Range Rover's main competition comes from other luxury SUVs. Three of its top competitors are the BMW X5, Lexus GX and the Mercedes-Benz GLS Class. The BMW X5 has a base price that is comparable to the Range Rover. It may be a bit more comfortable and luxurious on the inside too. The Range Rover beats it out when it comes to power, performance and off-road ability. The Lexus again may edge out the Range Rover when it comes to the interior. The Mercedes offers a smoother, better ride quality. The Range Rover wins hands down again when it comes to utility, power and performance. If you want a luxury SUV that can do it all, the Range Rover is the best choice. The 2019 Land Rover Range Rover is an amazing full-size SUV. It represents the best of what a luxury SUV can be. Best of all, it's fantastic when it comes to towing and off-road performance. It has a rugged, old-school appearance that will suit the tastes of some, but may not be everyone's cup of tea. 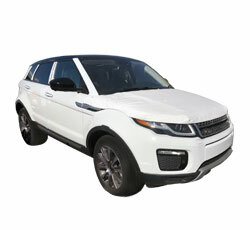 The Range Rover is a fun vehicle to drive and also a safe vehicle with some innovative features. The sheer number of available options is impressive too. If you're in the market for an SUV, the Range Rover is hard to beat.